Many details go into the construction of a men’s dress shirt, and the more attention one pays to these the better results one can achieve in purchasing and wearing one. 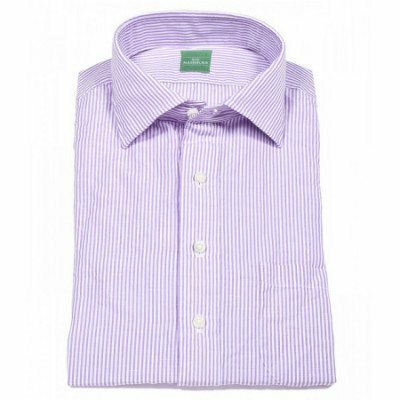 Shirt fabrics are given their own separate article; this article deals chiefly with the construction and design features of men’s dress shirts. If you haven’t yet read our introduction to dress shirts, we advise doing so as that it lays a foundation for this article’s topics.In retail stores, men’s shirts are sized by collar circumference and sleeve length. Most are cut to fit the most corpulent members of each size, and thus look blousy on most men. Those with an uncommon pairing of neck size and arm length have difficulty even finding a shirt that fits in these two places. 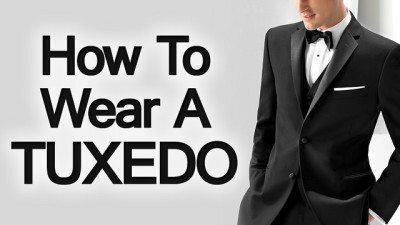 Since even the simplest alterations can add 25-50% to the price of a dress shirt, it is often more economical to have shirts made to one’s exact measurements. 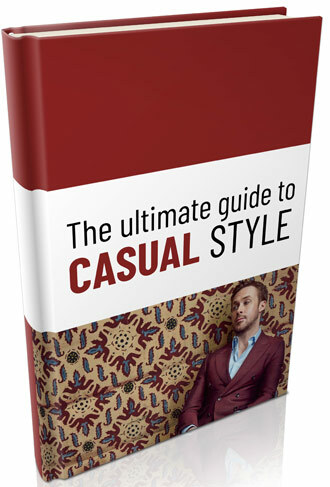 For a man starting out who is unable to afford custom-made, the best bet is to try on a lot of shirts until one finds a particular size of a particular brand that fits him well in the chest, stomach, neck, and sleeves, and then buy as many colors and patterns of these as he can find. Aside from fabric and fit, a man has a few matters of construction to consider when picking out or ordering a shirt: Collar, cuffs, pocket, placket, and pleats. 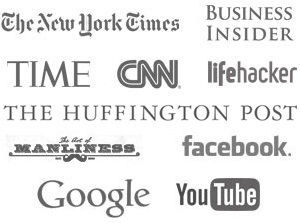 As with fit, in retail these are standardized to the lowest common denominator and one has little choice in the matter. Even in a store with thousands and thousands of shirts, you will likely be able to count on one hand the few that are really what you want. 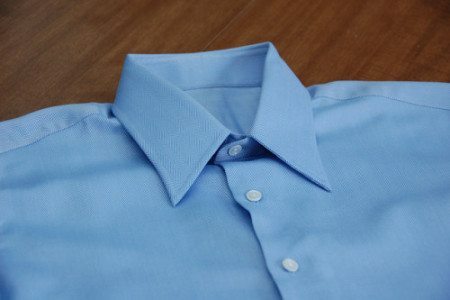 The men’s dress shirt collar is the most important, both in determining the garment’s level of formality and in flattering the wearer’s unique face. Button-down collars are the least formal, and are the best collars to wear without a tie. They also go well with a tie and sweater, blazer, or sport coat. The wing collar, which does not cover the band of the tie around the neck, is reserved for formal wear. Most men’s dress shirts sport some sort of pointed collar, but there is huge room for variety here. While the standard point collar looks good on most men, those with narrower faces do better with slightly shorter ones, while round faces carry well above long collar points. As a general rule, the greater the angle between the short sides of the collar points, the more formal the presentation. Spread collars, which leave a wide opening between them, take large tie knots especially well. The edges of the cut-away collar nearly form a straight line above the tie knot; this is the most formal collar arrangement. An exception to the parallelism of spread and formality is the tab collar: here little tabs of fabric extending from each side connect behind the tie knot, holding the collar close together and projecting the knot outward for a precise, no-nonsense look. The white contrast collar, in any style, with or without matching white French cuffs, is a favorite of power-dressers. While it certainly raises a suit-and-tie above the masses, let the wearer be warned against it if he cannot equal its eminence. On most decent dress shirts, the collar’s points are kept straight by collar stays. These 2- to 3-inch pointed splints are inserted into slots on the underside of the collar after ironing, and later removed for washing. Besides the plastic ones that come with most shirts, you can buy them in brass, silver, and even ivory, but their material has negligible effect on their function. 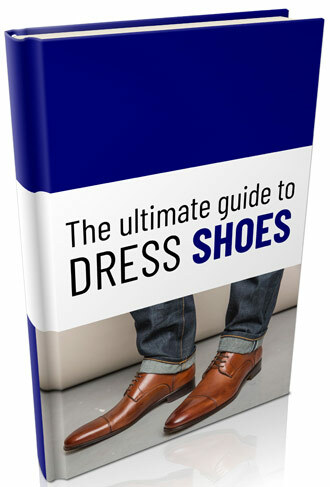 For a in depth look at dress shirt collars, click here. 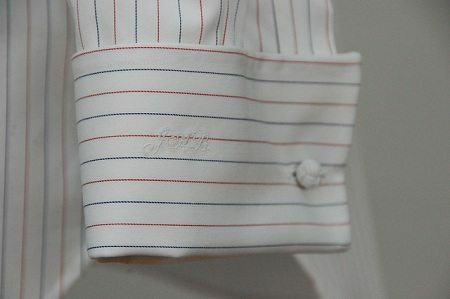 Barrel cuffs, standard on most dress shirts, come in a variety of styles and except for the most formal of occasions are never the wrong choice. The common variety have a single button; cuffs with two or even three buttons are somewhat more artful. French cuffs are de rigeur for formal wear; they look good with a suit but are always optional. A button in the sleeve placket helps the sleeve to stay closed during wear and can be opened to iron the cuffs; it is optional but nearly ubiquitous. The traditional left breast pocket adds a little depth to a dress shirt, especially if worn without jacket and tie, and can be useful for holding pens, tickets, and the like. A shirt with no pockets can look slightly cleaner with a coat and tie, but since the coat covers the pocket the difference is minimal when wearing a suit. As with most things, simplicity equals formality, so the pocketless shirt is the dressiest. The placket is the edge of the left front panel, with the button holes on it. 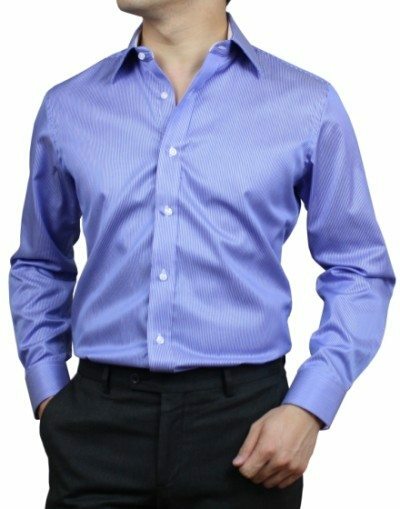 The standard placket is a strip of fabric raised off the men’s dress shirt front with stitches down each side; this is what most casual shirts and many dress shirts have. In the more modern French placket, the edge of the shirt front is folded over, creased, and held together only by the button holes. This cleaner front sharpens more formal dress shirts; it should not, however, be combined with a button-down collar. A man’s back is not flat; thus we use pleats on the back panel of a shirt so that the fabric may hang from the yoke (the piece covering the shoulder blades) and better conform to the body. There are two common varieties of pleated shirt back styles: the box pleat consists of two pleats spaced one-and-a-half inches apart at the center, while side pleats lie halfway between each edge and the center of the back. While the former are more common on ready-to-wear shirts, the latter better align with the actual shape of the back, and thus fit most men better. 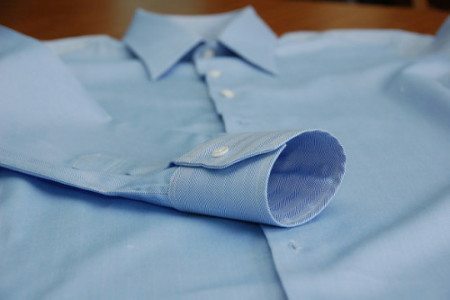 A well-made custom shirt can be cut and sewn to fit its wearer perfectly without pleats, and this makes it cleaner and easier to iron. Nonetheless, many men prefer to have pleats even on their bespoke dress shirts. Finally, a man may elect to have his shirt monogrammed, usually on the edge of the breast pocket (or in a similar place on a pocketless shirt). Monogramming originated as a way to identify one’s shirts in a commercial laundry, akin to writing a child’s name on the tag of their jacket. More recently, as the shirt has taken a more prominent role in men’s dress, the monogram has emerged as a way to subtly communicate the care a man has taken in obtaining his clothes. While large, garish monograms certainly do more harm than good, many men enjoy the quiet display of their initials, usually in a color similar to the shirt’s own.